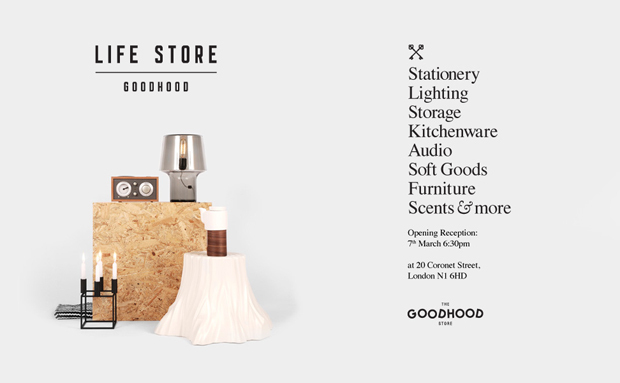 In a very interesting move, East London fashion store Goodhood have announced that they will be opening a homeware and accessories store called Life Store. We’ve been patiently awaiting the official announcement and today it came. At first it may come as a bit of a surprise, but when you start thinking about the aesthetic of the store and the range of accessories and trinkets that they stock already, this becomes a very logical expansion. Also, as streetwear heads grow up and get older, their tastes change and expand and homeware is definitely one of the top areas of expansion in this way. Promising a range of stationary, lighting, storage, kitchenware, audio, soft goods, scents and even furniture, the flyer gives little away other than the name, a list of potential products and a small idea of the type of items and aesthetic that the store will hold. Personally, we can’t wait to celebrate the opening on March 7th and wish the guys and gals at Goodhood all the best in this new endeavor.